Shabu, or the Japanese hot pot is one of my favorite meals. Quality beef slices swishing in kombu infused water. All you need is just a few seconds to cook the meat perfectly. 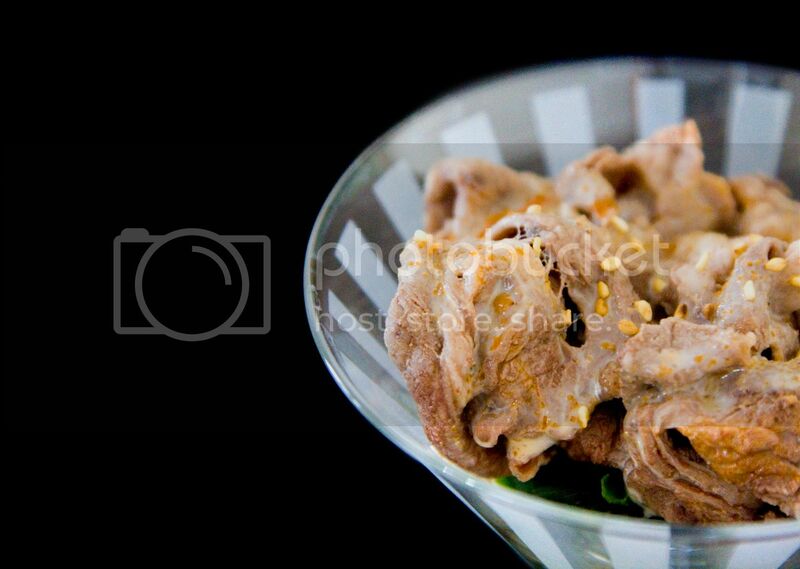 After that, I love to fully emerge the beef slice in spicy sesame sauce and indulge with steamy hot rice. However, preparing the whole shabu feast can be quite a work sometimes. Don't get me wrong, the cooking part is definitely easy, it's the preparation process that scares me away. I have to get all types of vegetables, cook rice, prepare noodles, not mentioning all the washing and soaking for the leafy greens. 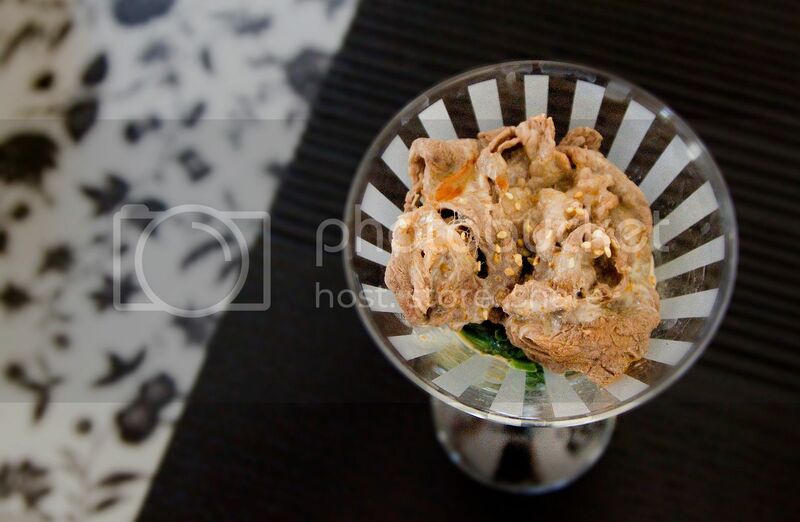 So instead, I came up with this tiny version of shabu, turning a big meal into one fancy glass of appetizer. I've tried several brands and this one is by far my favorite. 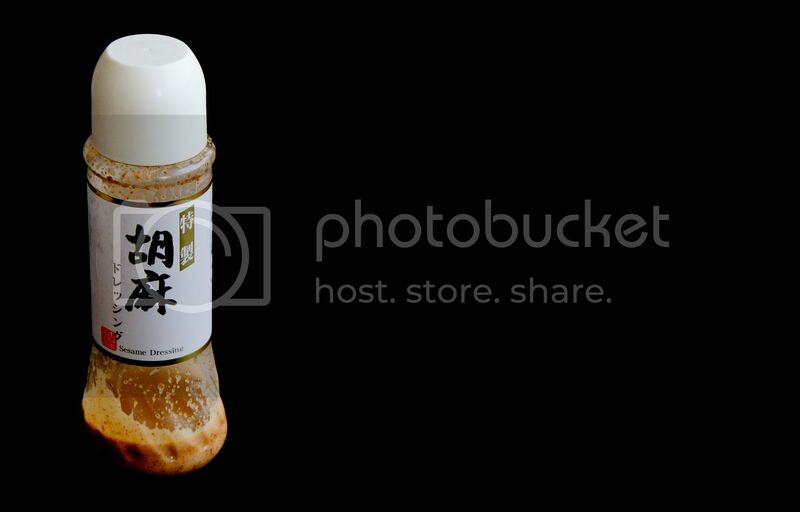 If you can't find any Japanese sesame dressing/goma sauce around your area, any Asian style sesame salad dressing will be a good substitute. Remember, the thicker the better for this recipe. Gently rinse the kombu under cold water and add into a pot of water. Bring to a boil then turn down the heat to keep it simmer for about 10 minutes. Add a small bundle of spinach to the water. Cook till wilted down then scoop out the spinach with a spotted spoon, leaving the kombu in the water. Prepare a big bowl with some ice cubes and cold water. Shock the spinach in this cold water, just a quick moment. This step will keep the nice green color on the spinach. 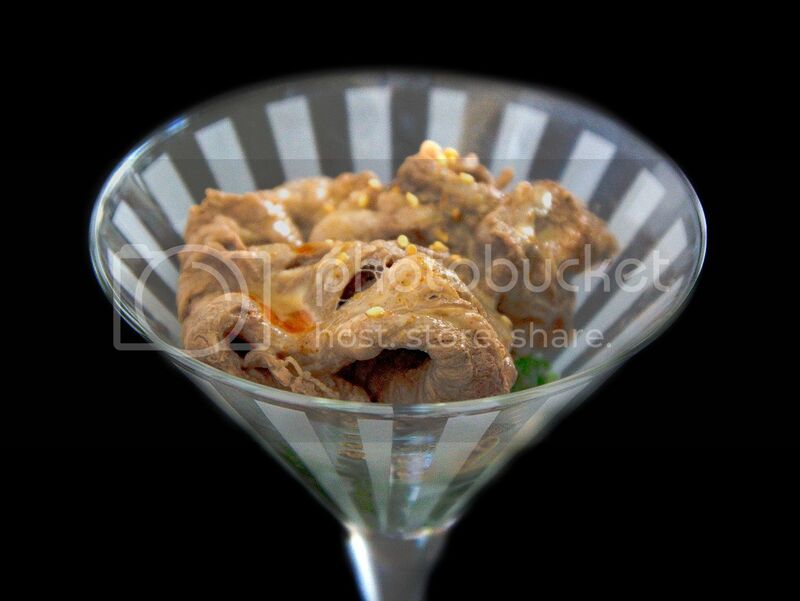 Once done, drain well and transfer to some cocktail glasses as the bottom layer of the appetizer. Using the same pot of kombu water and bring to a boil again. Cook the beef slices just till merely done. Perhaps slightly pink if the meat is in very good condition. Drain well and set two slices on each glass. Drizzle some sesame dressing, Sichuan peppercorn oil, and Chinese chili sauce over the beef slices. I like it with lots of sesame dressing. Sprinkle with some toasted white sesame seeds. You can skip the fancy look and simply serve the whole thing with a plate. I just like to dress up my food once a while, but that'll probably leave me with more stuff to wash in the end. Oh well, as long as I get my beef shabu, anything is compromisable.